Edit for clarification - I 'painted' the scallop with light from a torch (flashlight) and it's a two shot merge with the just the moon from a different exposure blended in to the original. The long exposure needed for the scallop 'blew' the moon out. This is superb. Lovely light through the clouds and on the sea. 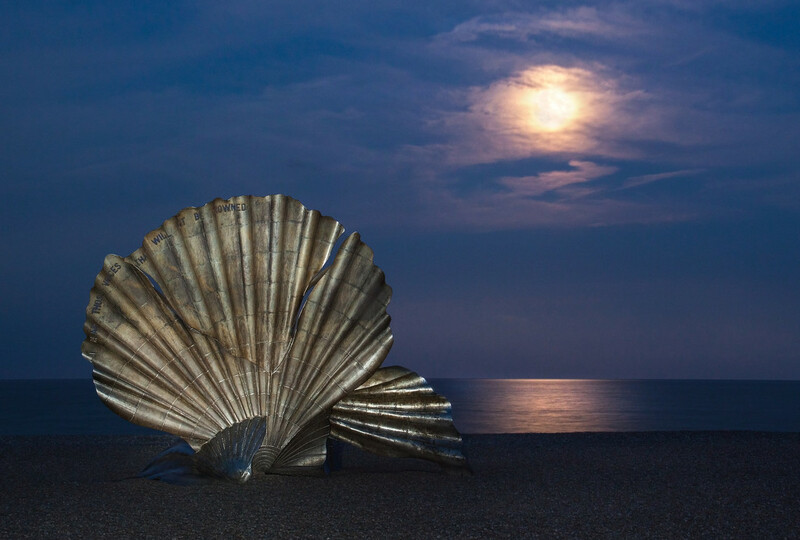 The scallop looks quite magical at night. Its shape is so defined, Lovely tones. Fav. @judithdeacon Thank you Judith for your lovely comment. The lighting is not all natural - I "painted" the scallop with light from a torch. Unbelievable! What a fantastic creation this is - the composition and the lighting make this magical. OMG love the tones, pov and the mystical feel of this shot! Mysterious and mystical, love that big seashell scallop, what is it, I mean the purpose of it and what does it say in that Scallop? Love the evening light on the sculpture. @susale Thank you, Suzanne. I've now put a link to some information into my caption. What a wonderful sculpture and a great capture of it Alison, fav. Excellent work! I wouldn't have noticed the addition if you hadn't said so. The light on the sculpture and reflection on the water are magnificent. FAV. Wonderful editing. A Very pretty result! So creatuve - love it! This is stunning. Following along. This is very creative. Nicely done. Such a beautifully done photo, love it! Love the forced perspective here. The background tones are wonderful too. The foreground painting is just the right intensity. There is always a tendency to over paint objects like that, but what you have managed is a good tonal balance against the background. Nice work. This has a magical quality to it. Love the tones and bit of mystery. This makes me feel as if I want to go there to relax and think about the people I love most.